When you try to decide what kind of kitchen countertops that you need, will you choose a natural material or a man made material? How are they different from one another? Which one is better? Currently, we will review the two very popular kitchen countertop materials and see the comparison of Granite vs Corian. There are many people who support one or another pointing out the advantages and disadvantages of each stone. Keep your eyes on this article for further information. Granite, a type of igneous rock, is formed when molten lava cools under the Earth’s surface. It contains minerals, like quartz, biotite mica, feldspar, and occasionally amphibole. The stone is blasted out of quarries as huge blocks of rock and then taken to a facility where the blocks are polished and cut into slabs for countertops. Though granite is a very durable and solid rock, it is naturally porous, meaning it can absorb spills in a way that can cause permanent damage. Still, it is not particularly easy to damage granite. Granite is quite scratch resistant, enough so that food can be cut on the surface with a knife. However, acidic foods and spills are likely to stain the stone, especially if they are not quickly cleaned. The stone is also very heat resistant and will not crack if a hot pan or pot is placed on it directly from the oven. Though very durable as a natural stone, granite will likely chip and crack over time and hard, long-term use. When this happens, it can be very expensive to replace it. Take a look: Soapstone vs Granite. 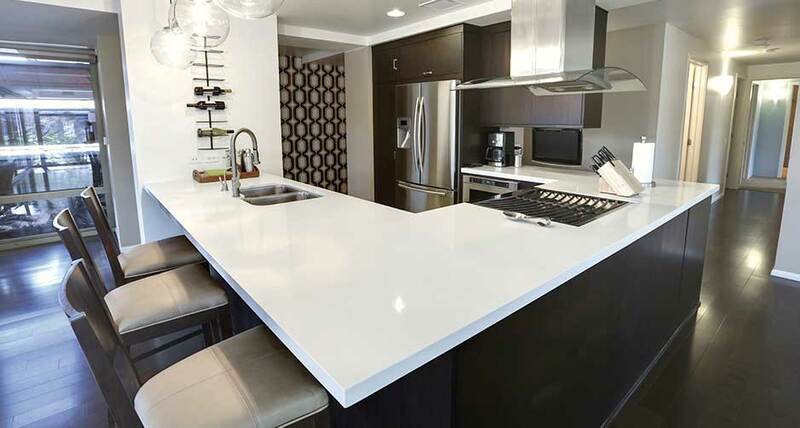 Corian is a man-made, solid surface countertop material. It is made using primarily polymer, or plastic. Corian is considered more attractive than cheaper countertop materials such as laminate or tile, but it is not as luxurious as granite. Some homeowners prefer Corian to granite because of the uniform look and the ease of maintenance. Corian is also stain-resistant, easy to repair and available in a wide variety of designs and colors. Corian is prone to scratches and minor nicks, although minor scratches can be removed with a scouring pad. 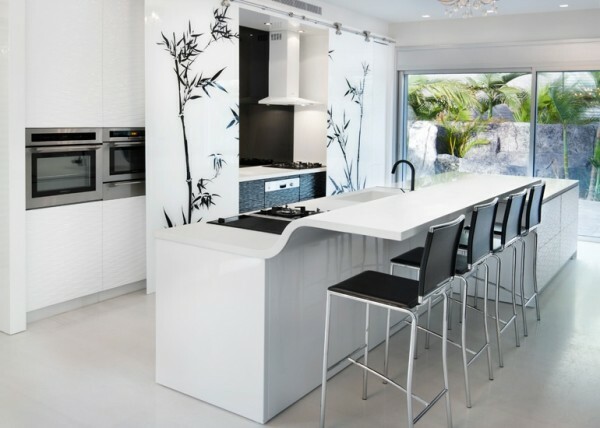 Most Corian can withstand heat, but it is not resistant to temperatures above 325 degrees Fahrenheit, and prolonged exposure to high temperatures is likely to cause discoloration. Hot pots and pans cannot be directly placed onto a Corian surface. Corian does not harbor bacteria and is therefore a very hygienic surface, moreover, any spills are easy to wipe off. This makes Corian a convenient countertop surface for kitchens, hospitals, or laboratories. Overall, about both, Corian does not necessarily have the elegant reputation of granite counter tops but Corian products are very attractive. On the other hand, many people like the natural appearance of granite. Granite adds a luxurious feel to any kitchen and is appealing because each piece of granite is unique. No one else will have the same granite piece as you, like a piece of art. After all, when you try to decide, it all based on personal taste.